The undeniable highlight of Brazilian Outlaw Country Rock'n'Roll! This band truly knows how to rock, for more than 10 years they headline all over Brasil and are wanted all over Europe, Japan and the United States. Don't expect any Samba or Carnival tunes, but a real outlaw mixture of Country, Hillbilly and candid bad Rock'n'Roll to the bone. 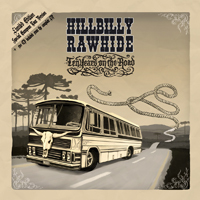 To celebrate their 10 year anniversary, Hillbilly Rawhide are planning a 4-week tour all over Europe, with gigs at several festivals and at the most dirty clubs. But no celebration without a nice present! Drunkabilly Records will release a special Limited Edition LP + CD (exclusively for this tour only) featuring brand new songs on the A-side, and some of their best classic tracks on the B-side. Don't miss this dashing release by one of the finest dungy Brazilian acts! RELEASE DATE : MARCH 1st 2013!! !